The last time I told you about a Rocket Raccoon statue, it was a mere three feet tall. This one? Double that. The Rocket Raccoon statue scale wars have been escalated. That said, this new statue from Section 9 Entertainment and Muckle Mannequins kind of cheats a bit - Rocket, who is life-sized at around 56", is joined by a giant base bringing him up to 78" tall - or 6 and a half feet tall. 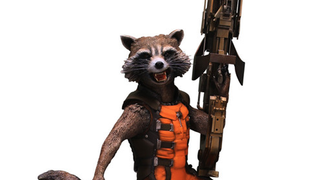 Aside from being absolutely ginormous, it's a pretty gorgeously detailed statue of Rocket, captured mid-snarl and wielding his trusty rifle, but before you get too excited about the prospect of owning 84 lbs of Raccoon shaped statue goodness (that's something people get excited about, right? ), you may want to hold off until you see the price - a whopping $4,897. That 3 foot foam-based one doesn't seem so pricey now, does it? Hell, you can get a life-sized Captain America for less! If the Rocket mania has taken you and you'd like one, you can buy it at Section 9's website.